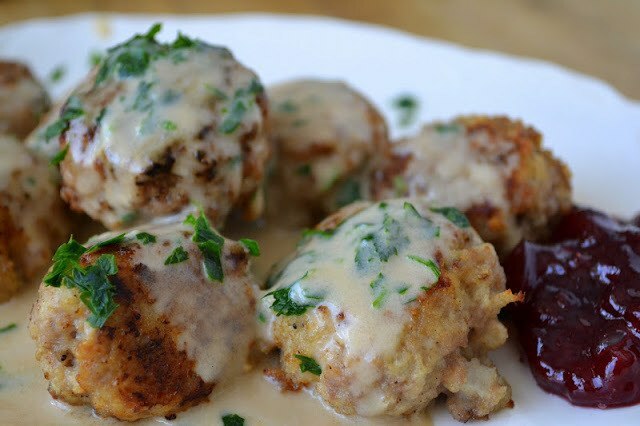 Copycat Ikea Swedish Meatballs ~ light as a feather meatballs in a lightly spiced brown gravy that will quickly become a favorite family meal! Saute the onion in the butter for about 5 minutes. Put all the ingredients into a large mixing bowl. I like to break up the meat first, just to avoid having to manipulate it too much during the mixing, and break up the mashed potato as well, to be sure that gets evenly distributed. Gently mix everything together with the tips of your fingers. Keep it light and airy, don't compact the meat. Form into small balls, I used a 1 1/2 inch scoop to get even amounts. Set aside. You can refrigerate the meatballs at this point and then brown and bake them just before dinner. Heat 2 Tbsp butter (you can also use olive oil, or a combination of the two) in a pan and brown the meatballs on all sides, in batches. Transfer to a baking sheet. The meatballs are very delicate, so I used two forks to flip them over during the browning and then to transfer them to the baking sheet. Bake the meatballs at 350 for about 10 minutes, you want the interior temperature to be about 170. If you made larger meatballs, they'll take a bit longer. To make the sauce: melt the butter in a pan and add the flour. Cook for a minute, but don't let it brown. Add the stock and bring the sauce to a simmer while it thickens. Add the cream and heat through. Season with the soy sauce, salt and pepper. At the last minute add the parsley and some fresh nutmeg. Be sure to check the seasoning and adjust if necessary. Ladle the sauce over the meatballs and serve hot.